Loving the new Office icons! Wow, this is looking nice… although the changes (except the O12 icons) are subtle. The icon labeled ‘SharePoint’ will be for Groove 2007, I think,and the ‘Unknown’ will most likely be Communicator. Why are the older screenshots (esp. the start menu) lower quality than the new ones. Can we get an unbaised comparison w/o cheap tricks like a blurry “old” image and a sparkling new one? The sharepoint icon is probably groove. The Unknown icon looks like a gannt chart. Project perhaps? I don’t think the Power buttons have been changed? The “Yellow” one simply is the icon for “Standby” or “Hibernate”, and the Red one is “Shut Down”. There is no changes between the new and the old in terms of colour and the actual button. You can change it in any build by going to Power options in Control Panel. I like to correct you for the Power Icon, the one you have put ofr build 5456 is the same for the new start menu. Hold it right there. What you’re writing about is a bunch of concept artwork for Vista, not actual screenshots, I’m afraid. My guess is we won’t be seeing these changes happen. 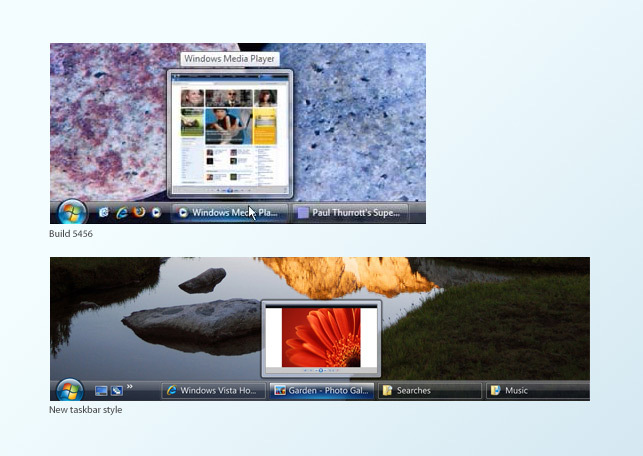 No, these are actual screenshots from an interim internal build of Windows Vista. These are changes that have been already applied. The icon labeled “Money?” is more than likely Small Business Accounting. Especially since Money is not an office application. Fair enough Long – I hope you’re right then! Looks like the icon on the Quick Launch bar on the right might be the new icon for Media Center. Oops never mind, Flip 3D it is. Unofficially people have been reproducing them as ICO files straight from the JPG posted on the website, however these are lower quality and unpolished. I would presume the new icons will make an appearance in the next beta build of Office 2007.
nice post man, but the power button thing is a little different than you suggest. the states and colours of the power button changes depending on how it’s configured. if it was setup as a shutdown, it will appear red with the full circle, but as hibernate it will appear as the broken circle. this can be adjusted in power management. Notice that the curved-box behind the applications look very much like the packaging design for the Windows Vista versions. Is there download of these office icons, help please.